Queensland Fire & Emergency Service’s cadre of expert swiftwater rescue instructors were recognized today by being awarded ITRA Level 3A and 3B instructor certification, the Association’s highest level of instructor. 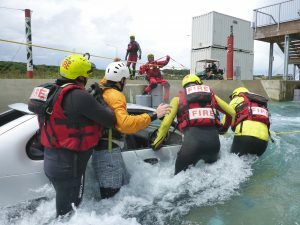 The instructor group traveled to New Zealand where they trained on a swiftwater vehicle rescue simulator at Vector Wero whitewater park (a ITRA bronze founding supporter). The cadre was certified by New Zealand based ITRA Chairman, Steve Glassey and fellow steering committee member, Geoff Bray. Watch the TVNZ news video article here.